First Lady Auxillia Mnangagwa had to cut short her attendance at the 63rd UN Commission on the Status of Women (CSW) on Monday to assist affected citizens following the devastating effects of Cyclone Idai that has so far claimed 139 lives in Zimbabwe. 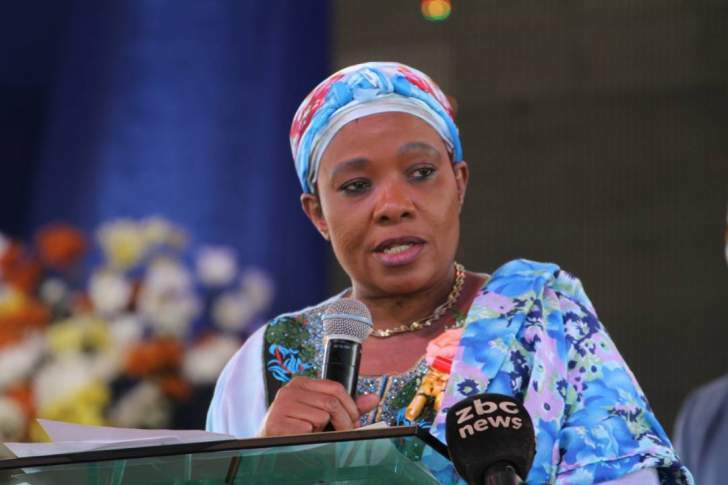 Women Affairs, Community and Small to Medium Enterprise Development Minister Sthembiso Nyoni said this at a CSW side presentation on Tuesday where the First Lady was expected to present humanitarian work she is doing aimed at uplifting women through her Angel of Hope Foundation. "As Minister and leader of this delegation, I saw it fit to invite our First Lady to this year's CSW to come and share her most humbling and wonderful works which she is doing through her Angel of Hope Foundation back home. "I also want to convey an apology from our First Lady who could not be here with us today as we all know that our country was hit by a cyclone which affected parts of our country and our First Lady, as a responsible leader, had to fly back home to see to it that the affected citizens are assisted," said Minister Nyoni. Angel of Hope board member Ms Rachel Nield Geranios, on behalf of the First Lady made the visual and oral presentation. Ms Geranios chronicled how the First Lady dedicates her time and energy visiting marginalised communities around Zimbabwe. She constantly broke down in tears as she recalled what she and Mrs Mnangagwa saw on their first visit to Kanyemba's Doma people in the Zambezi Valley. "I recall the first day we visited Kanyemba. After spending the whole day on the road, we reached the place at night and we had a guide who was at the front of our convoy as we navigated through the tall grass and trees as there were no proper roads to follow. We asked the first man we met on who was authoritative to receive us. "He came out wearing a school uniform of a girl and when he returned, the next one came to us also wearing the same dress meaning they were exchanging the same dress so as to try to be presentable to us. We were touched by that. These are people who have lived many years isolated from the majority of Zimbabweans. They are hunters and gatherers. "Child marriages are rife in the area because once one reaches adolescence, his or her family automatically weans him or her and they should become independent and responsible. The first child mother we saw was a 13-year-old girl who previously had two still births," she said. "Amai Mnangagwa, with the assistance of her partners initiated the construction of a clinic and maternity waiting house. She also started nutrition gardens, fish farming and orchards to ensure that the villagers become self-reliant and take charge of their own lives. "To help them achieve that, she provided fence for the gardens, ploughs, bicycles, food hampers and also distributed preparation kits for expecting mothers as a way of encouraging them to visit the hospital during pregnancy. She also engaged local chiefs and talking to them about the importance of eradicating child marriages." "Upon realising how cancer was killing women, the First Lady initiated cancer awareness campaigns and she has gone around the country teaching women on the importance of getting screened. She also toured with a mobile cancer testing clinic, an initiative which has seen hundreds of thousands of women being screened and treated for cancer," she said.